LITTLE BLACK CLASSICS MINI REVIEWS | 10, 13, 19, 37, 42. I’m going to try and collect them all because I think it’s such a cool idea. 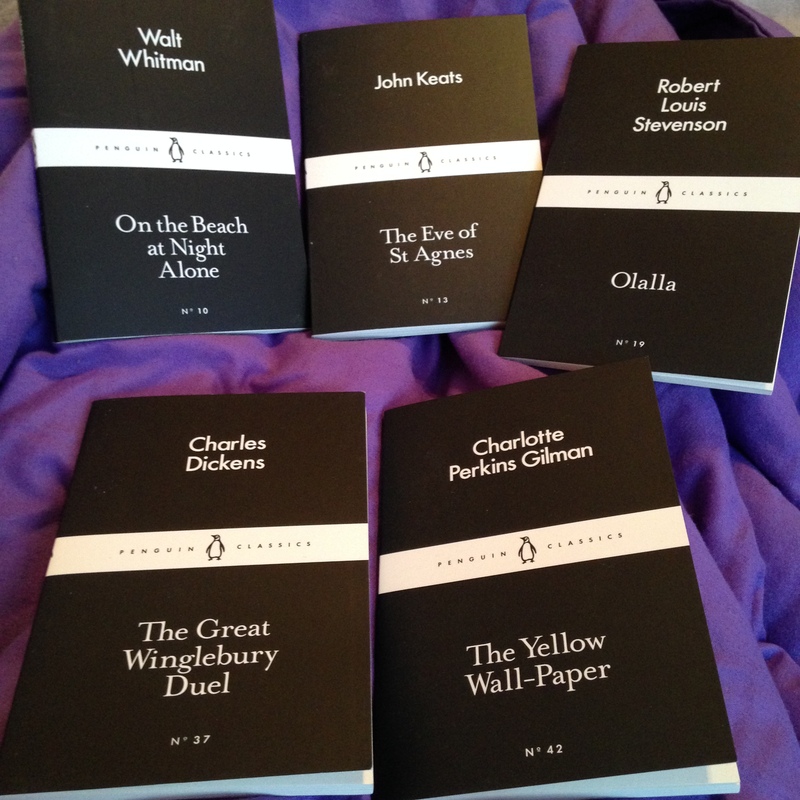 Some of the little black classics include short stories by Jane Austen, Charles Dickens, H.G Wells to poetry by Walt Whitman and John Keats. I also picked up The Communist Manifesto a couple of weeks ago too. It’s such a massive range filled with interesting texts, that I just want to get my hands on them and read them all. The helpful thing is that they’re visibly numbered so I know what numbers I’ll need to get! Here are the ones I read this month! 1. On The Beach at Night Alone – Walt Whitman. A small collection of Whitman’s poetry with lots of water-based imagery. I really liked this collection. Some of his narrative poems were a bit long winded and it felt like the point had been made but overall, I thought this was a nice collection. Truth be told, I picked this one up because I’m currently obsessed with Breaking Bad and I remembered reading somewhere that Walter White’s name was inspired by Walt Whitman’s name. 2. The Eve of St Agnes – John Keats. Another small collection of poetry written by John Keats this time. I picked this up because I had read his collection of letters to Fanny Brawne and thought they were beautiful. However, I didn’t feel the same about this collection. His narrative poems are so long winded that I became bored reading them because it felt like I was reading the same thing, just written in different ways. 3. Olalla – Robert Louis Stevenson. I was a bit apprehensive when I picked this up in the shop because I didn’t particularly enjoy Dr Jekyll and Hyde but the synopsis sounded awesome! From what I can remember, Olalla follows this guy, he goes to live with this family and falls in love with the daughter of this family and, wait for it, SHE’S A VAMPIRE! The first 40 pages were so boring and kind of cheesy but the ending was awesome because things started to happen! This edition contains two stories from Dickens’ ‘Sketches by Boz.’ I’ve only ever read Great Expectations by Dickens but I found these short stories to be more interesting. I found these to be surprisingly quick to read, considering Dickens’ works are usually incredibly wordy, it took me months to read Great Expectations. But then if I was being paid by the word I’d milk it too :’). These stories are based in London and follow Londoners doing London things really. Not much I remember from it but I know I liked them! 5. The Yellow Wallpaper – Charlotte Perkins Gilman. A fantastic short story collection! The Yellow Wallpaper follows a woman, her husband believes she’s going mad and he’s a physician, which must mean his diagnosis is legit obviously, and he keeps her in this room with yellow wallpaper and she starts to believe that women are living within this wallpaper. It’s really great. It’s been regarded as a feminist text and I can definitely see aspects of that in it. The problem I had with it was the unreliable narration, it just made me very confused at times. This edition comes with two other short stories that weren’t as memorable as TYW but still very good. Hope you enjoyed this collection of mini reviews! My favourites were definitely The Yellow Wallpaper and On the Beach at Night Alone! Previous Previous post: SOME VIDEOS YOU MAY HAVE MISSED! Next Next post: APRIL WRAP UP!